The World Heritage Committee on Monday added an extension of South China Karst, a natural World Heritage Site since 2007, to the World Heritage List of the United Nations Educational, Scientific and Cultural Organization (UNESCO). The extension, with a total area of 1,186 square kilometers, includes the Jinfoshan cluster in Chongqing Municipality, the Shibing cluster in Guizhou Province, and the Guilin and Zhujiang clusters in Guangxi Zhuang Autonomous Region -- all in southwest China. 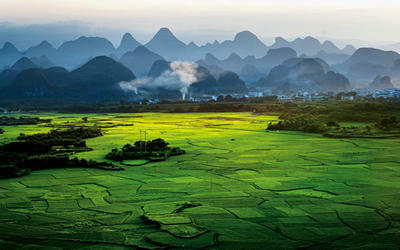 Experts believe that the addition of South China Karst (Phase II) makes the listing more complete. The two parts group the world's most unique karst physiognomy, which evolved from plateau to plains. Karst topography is a distinctive landscape formed from the dissolution of layers of soluble bedrock, such as limestone, dolomite and gypsum. It is characterized by underground systems with sinkholes, dolines and caves. It may also result in a variety of large- or small-limestone pavements, poljes, karst valleys, clints, flutes, vertical shafts on the exposed surface. The World Heritage Committee, which was convening its 38th annual session in Doha, Qatar, added China's 2,400-year-old Grand Canal and a section of the ancient trade route of Silk Road to the World Heritage List on Sunday. With the three successful inscriptions, China has already become No. 2 on the list with 47 sites, only behind Italy's 50 sites. Li Rusheng, deputy head of the Chinese delegation to the convention, lauded the new inscription, saying the approval is conducive to helping the world deepen its understanding about China's unique natural resources and strengthening people's consciousness of protecting natural resources, especially special heritage resources.